The “Technical Circle” is a very efficient drill. The kids have to perform several different technical tasks, which will benefit not only their technical skills but also improve their feel for the ball. Plus it’s great fun! Two players are positioned at cones set up all around the circle. A cone is positioned in the center of the circle, one for each group of two. The players now have to perform several tasks. 1. The first player takes the ball in his hands, slowly runs towards the cone while he tries to kick the ball up with his thighs with one touch, before catching it again with his hands. Once on the left, once the right and so on. He then turns around and throws the ball back to his partner who then performs the same task. 2. Now we raise the level of difficulty. Instead of his thighs, the player now has to use his feet and kick the ball back into his hands. Instead of throwing the ball back to his partner, he volleys it. 3. Now the players have to juggle the ball on their way to the center. In the easiest variation the pattern is left, right, catch. Good players can try to juggle more often. After that, they bicycle-kick the ball back over their head to their partner. It is possible to award points here to create a small and positive competitive situation. Three points for dropping the ball once, five points for directly catching the ball. 4. Now two players stand left and right next to a cone. One player rolls forward, while his partner slowly passes the ball towards the center cone. He then tries to catch the ball before it reaches the cone. This time the ball is played back with a drop-kick. 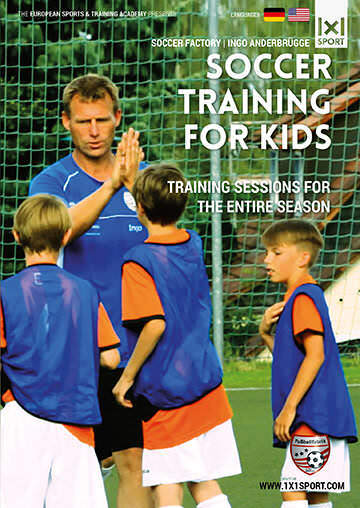 Set up professional soccer practices that are effective and fun. Enough training material for the entire season. Make training more fun for yourself and your players. Developed by German soccer legend Ingo Anderbrügge.